Browse: Home / Instarecon v-0.1.0 released – Basic automated digital reconnaissance. Instarecon v-0.1.0 released – Basic automated digital reconnaissance. …all printed nicely on your console or csv file. InstaRecon will never scan a target directly. 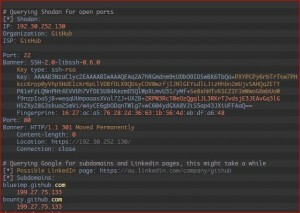 Information is retrieved from DNS/Whois servers, Google, and Shodan. Holds all Host entries and manages scans, interpret user input, threads and outputs. 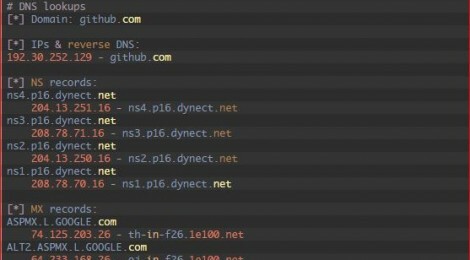 nameserver -- Str DNS server to be used for lookups (consumed by dns.resolver module). targets -- Set of Hosts or Networks that will be scanned. bad_targets -- Set of user inputs that could not be understood or resolved. versobe -- Bool flag for verbose output printing. Passed to logs. 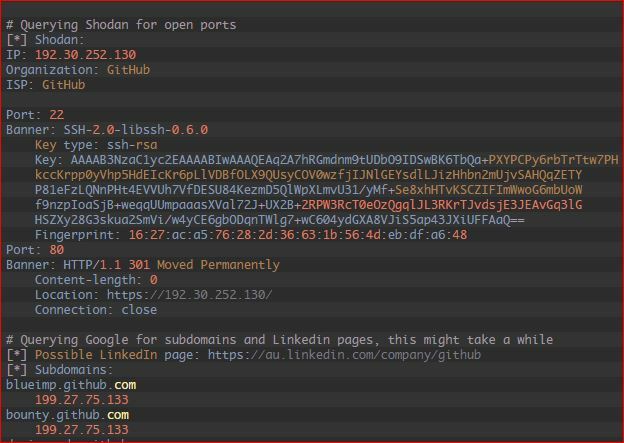 shodan_key -- Str key used for Shodan lookups. Passed to lookups. For this, it attempts to create these objects and moves on if got a ValueError. # Test if user_supplied is an IP? # Test if user_supplied is a valid DNS? """Does all possible scans for host"""
"""Does only direct and reverse DNS lookups for host"""
"""Does reverse dns lookups on a target, and saves results to target using target.add_related_host"""
"""Test if file is writable before running any scan"""
"""Writes output for each target as csv in filename"""
[-] WARNING:Timeout resolving 192.30.253.8. Retrying. [-] WARNING:Timeout resolving 192.30.253.150. Retrying. [-] WARNING:Timeout resolving 192.30.253.174. Retrying. [-] WARNING:Timeout resolving 192.30.253.188. Retrying. [-] WARNING:Timeout resolving 192.30.254.2. Retrying. [-] WARNING:Timeout resolving 192.30.254.230. Retrying. [-] WARNING:Timeout resolving 192.30.255.61. Retrying. [-] WARNING:Timeout resolving 192.30.255.99. Retrying. [-] WARNING:Timeout resolving 192.30.255.136. Retrying. [-] WARNING:Timeout resolving 192.30.255.174. Retrying. [-] WARNING:Timeout resolving 192.30.255.211. Retrying. [-] WARNING:Timeout resolving 192.30.255.247. Retrying. ← Updates Windows-Exploit-Suggester revision v-2.6, 2015-06-18.